Young people are leaving the church in droves. It is time to face the truth of this reality. And, it is time to ask why. People don’t just run away from loving, open, and hospitable communities. Yet, young people are sprinting in the opposite direction of traditional Christian denominations. Why is this? Here is my proposition; young people are running away from the Catholic church (and other mainline Protestant traditions) because the beauty of tradition has the potential to fatally reduce relationship. And this is problematic because relationship was far more important to Jesus than tradition. Jesus’ first encounters with people (aside from the Pharisees) were relational. He walked with people before He instructed them. He loved people before He challenged them. Yet, all too often, when we think about Jesus, we equate Him with our religious traditions and guidelines forgetting that what He wants above all is a relationship with us. And in our attempts to be like Jesus, we can fall into the same trap. Many think that to love people well is to promote religious traditions and guidelines. Thinking that our job is to lead the people in our lives to Christ through the framework which we cling to, we often forego relationships along the way. Have you ever walked into a church and been greeted by no one? I have. I walked in and out of the same Catholic church (by myself) for over a year without a single person around me asking my name or greeting me. And I left that church in search of a loving community. Tradition and ritual cannot be substitutes for relationship. Relationships must always come first. Rituals only enhance the tangible experience of being loved by God and by our brothers and sisters in Christ. We tend to put Jesus in a box. We tend to see Jesus as someone who fits perfectly into our particular religious framework. And yet, even when Jesus walked the face of the earth, He failed to fit into any religious tradition. Sometimes He was found “in the temple, sitting among the teachers, listening to them and asking them questions” (Luke 2:46). Sometimes He was spotted breaking the sacredness of Sabbath while Pharisees responded to Him saying, “Look, why are they doing what is not lawful on the Sabbath?” (Mark 2:24). Jesus was a devout Jew, yet He was frequently spotted deviating from traditional Jewish teaching. He taught in synagogues, but hung out with Samaritans. He was reportedly the “King of the Jews,” but He died for the salvation of all of humanity. Why did he deviate so much? Why did he appear so comfortable in a multitude of religious traditions? Because Jesus was inclusive. He was relational. He saw God in everyone and loved people without necessarily forcing them to be exactly like Him. Saint Teresa of Calcutta did this better than anyone I know. She epitomized what it means to love people holistically . She walked with people and cared far more about relationship than conversion. When I left the church, I didn’t leave Jesus. When I left the church, I clung to my relationship with Jesus. I spent some time in a beautiful, grace-filled Methodist church. I also visited an Episcopal church, a Presbyterian church, a few non-denominational churches, and I surrounded myself with an incredible Protestant community of people. And I was struck by the fact that this community didn’t care where I went to church. This community only cared about my relationship with Jesus. This response was strikingly opposite from that of my Catholic community. They cared way more about what ritual I was partaking in than about my relationship with Jesus. So my challenge to you today is to focus on relationships over and above religion. Young people are leaving the church in droves because we have forgotten about the good news of relationship. What might change if we took our cues from people like Jesus and Mother Teresa? If we converted people to be better followers of Christ, not better church-goers? We are not the Savior. It is not up to us to make sure that people are going to church in the “right” place. 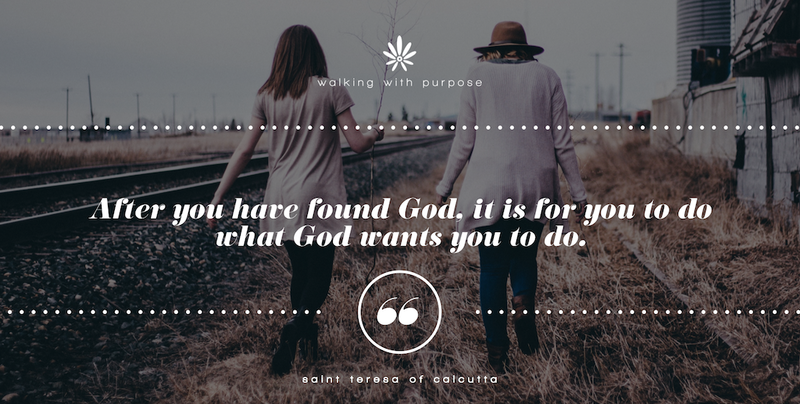 As Mother Teresa said, “after you have found God, it is for you to do what God wants you to do.” Jesus is the only Savior. We are simply called to love one another. Allow young people to explore their relationship with Christ. Recognize that truth and goodness exists in every Christian denomination. The Catholic Church teaches that every baptized Christian who believes in Christ is, in a certain sense, in communion with the Catholic Church (CCC #838). So, let your young people discover Catholicism in new ways. It was my leaving the Catholic Church that allowed me to love and appreciate the Eucharist in the way that I do today. Jesus knew that would happen when He sat next to me in every single Christian church that I tried out. But He also knew that my relationship would be forever transformed through an encounter with each of these denominations. And He knew that this transformation was necessary for me to do the work He had created me to do. Jesus is the only Savior. He is the one walking in relationship with your wrestling young person. I pray that you would believe that today. P.S. Please join me on Instagram Live (Thursday at 10am EST)! I’ll be talking about how it took stepping away from the Catholic Church for me to discover the unique beauty of the Eucharist. Feel free to send any questions or thoughts to community@walkingwithpurpose.com.